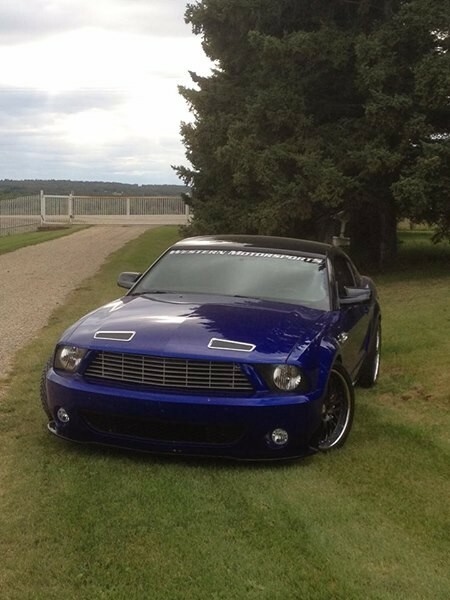 Now available for sale by The Motor Masters is a 2005 Ford Mustang “Vanquish’d” Street Show Car. he name Vanquish’d hints at what lays under the hood, a 2001 Aston Marin Vanquish 6.0L V12, Fords most exotic engine built for Aston Martin. Created by Western Motorsports for the 2006 SEMA show. This was a ground up build using the finest components and thousands of hours of custom work. Still in NEW condition with under 2000kms. 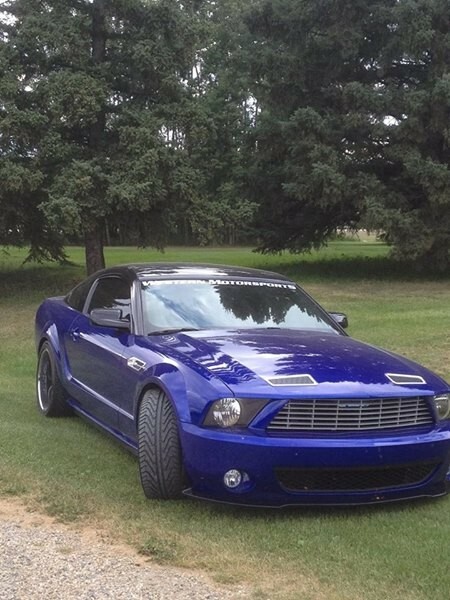 This is a “one of a kind” vehicle and has won numerous awards including World of Wheels Best in Class, ISCA Outstanding Street Machine, Popular Hot Rodding as well as appearing in many Magazines including a 5.0 Mustang and Super Fords Feature. Motivation for this project came from Aston Martin’s Vanquish’d V12. When Ford purchased Aston Martin, this was one of the engines they helped design. Many of the components were built by Costello and Ford. 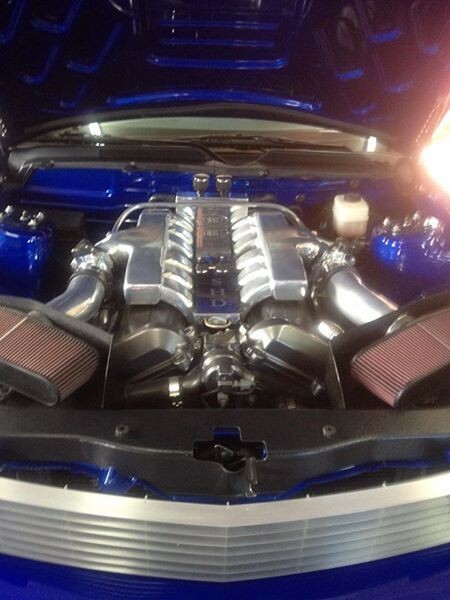 The stock engine was 520hp but have done considerable work to enhance ours to make it over 600hp. 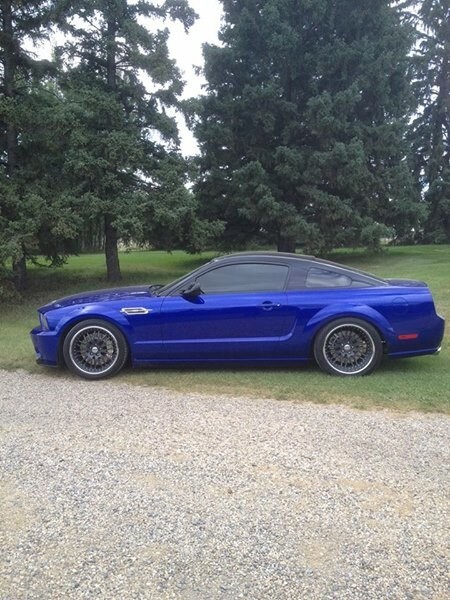 Stronger rods, forged pistons, head porting and Custom intakes. Custom long tube headers were fabricated to fit the Mustang that feature a 6-2-1 design with stepped primaries and merge collectors. The engine compartment alone is a show stopper with hidden wiring, ceramic coating and fantastic looking twin intakes. The V12 power is amazing and the engine will pull strong right from 1500rpm to he 7500rpm redline. Twin SDS programmable engine management system provides excellent drive ability in any conditions. The long tube headers, 3″X-pipe and 3″ Magnaflow exhaust work with the V12 to provide an exotic sound that is sure to turn heads. Behind the engine is a TEMEC-T56 transmission that was fitted to allow smooth shifting and enough gears to outrun an Aston Martin at its top speed. A Mclead duel disc clutch is used to harness the power while providing a smooth, light pedal feel. An Aluminum driveshaft attaches to the Ford 8.8″ rear end that was built with a Tru-Trac torque sensing differential and Moser Custom axles. The suspension was designed to provide maximum handling and grip while providing a decent ride. KW suspension double adjustable coil over are used front and rear along with custom sway bars and control arms. Weight balance is fantastic as is the all aluminum V12 is no heavier then the stick V8 that came out. iForged Essen Wheels, 19×9 in the front, 19×12 in the rear, are wrapped in Michelin Pilot Sport. Tires. 275/357R19 in the front and whooping 345/30ZR19 in the rear. Considerable suspension and chassis work was required to fit the massive rear tires but we knew they were needed to put the V12 power to the ground. Lots of “whoa” was provided by the Baer Extreme 14″6 piston from brakes and the 14″ Baer Eradispeed rears. The Mustang body was revised to pick up some of the Aston Martins Styling cues while retaining the Mustang’s muscular heritage. 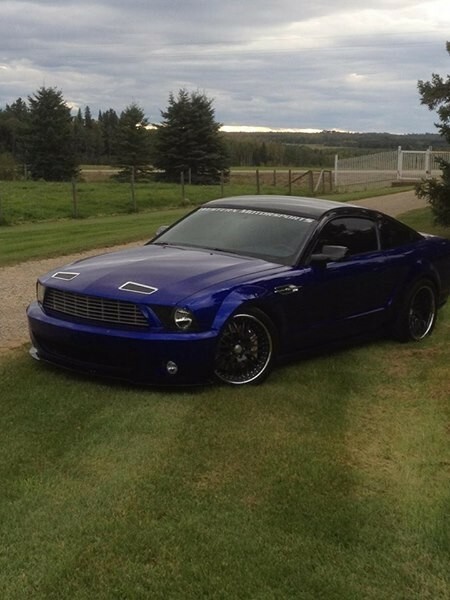 Custom Colecraft billet aluminum fender and hood vents were used along with WMS aluminum grill fitted to a modified GT500 nose. BASF R-M Carrizma Candy Blue Paint was sprayed, cleared and wet sanded for an impeccable deep finish. The Top , splitterand mirrors were sprayed with Black Candy over the blue to blend in with the Classic Design Concepts Glass Roof. The Glass Roof offers an incredibly open feel to the interior while blocking out the sun. No expense was spared on the interior with Cobra Missano Black leather/ Blue Alcantra seats with matching Blue Alcantra in the rear seats and door panels. A custom dash, painted body color, houses an AiM Strada Dash/ Datalogger that gives he driver a distinctive road race feel. This is complimented by a Sparco leather and Alcantra Steering wheel with Schroth 4 point belts. NO TRADES! Don’t miss out on an opportunity to buy a SEMA Performance Mustang! Give us a call TODAY!